When the El Tovar Hotel opened at the end of the railroad line in the early 1900s it was considered one of the most elegant hotels west of the Mississippi. Today El Tovar Hotel is welcoming guests to Grand Canyon National Park with as much care and hospitality as they did 100 years ago. El Tovar provides 78 rooms and suites all with cable television, telephone, full bath, in-room coffee, and air conditioning. There are three styles of accommodation at the El Tovar Lodge: standard; deluxe & suites. 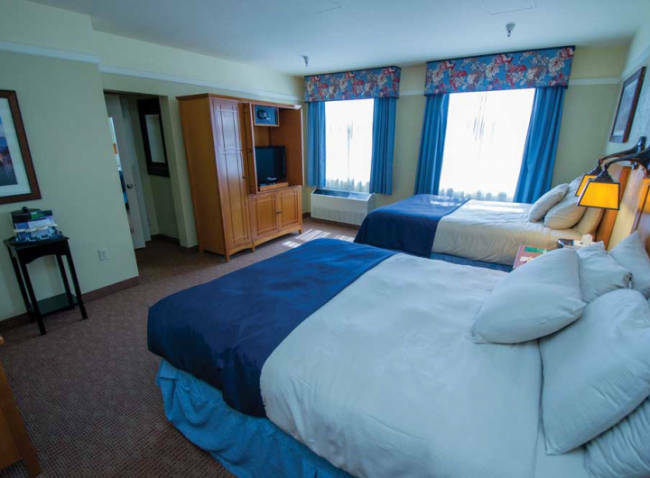 Each room category offers a number of bed arrangements. All rooms at El Tovar are non-smoking. 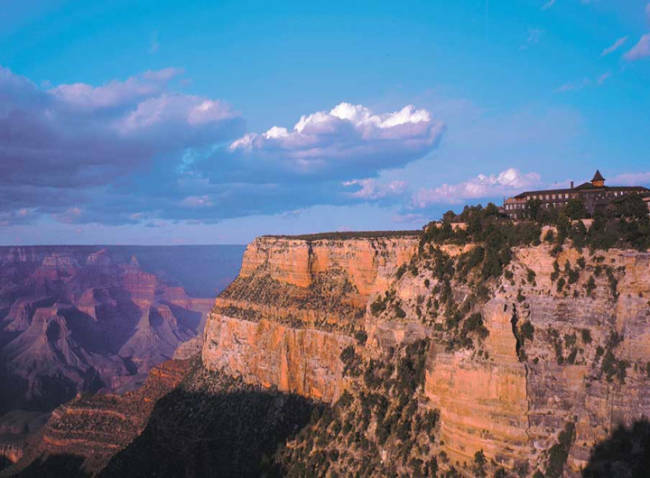 El Tovar is a large lodge built just steps away from the very edge of the south rim. The first floor is sheathed with log slab siding complete with finely-honed corner notching that gives the appearance of log construction. The upper stories have rough weatherboards. Log-slab moldings surround the windows on the first floor; those on the upper stories have heavy, milled moldings. You will find a comfortable and inviting lobby upon check-in where peeled log posts with carved corbels support the floor of the mezzanine lounge above. The mezzanine lounge is an octagon shaped balcony that overlooks the registration lobby. The El Tovar Hotel is brimming with elegance and charm. The El Tovar Dining Room features beautiful construction work incorporating native stone and Oregon pine in a traditional mix of decor and ambiance. The menu at El Tovar blends regional and classical flavors while utilizing contemporary techniques. The El Tovar dining room is considered one of the finest dining establishments at the Grand Canyon. The restaurant at El Tovar serves breakfast, lunch, and dinner. The Standard Double rooms at El Tovar Hotel can be located on any one of the hotels three floors. These rooms have one double bed and a private bath. 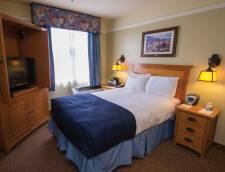 Amenities include cable TV, in-room coffee, telephone, air conditioning and a safe. All rooms at El Tovar are non-smoking and pets are not allowed. The Standard Rooms at El Tovar come with a one or two queen beds and include a private bath. 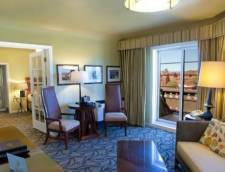 These rooms can be located on any of the three floors in the hotel. 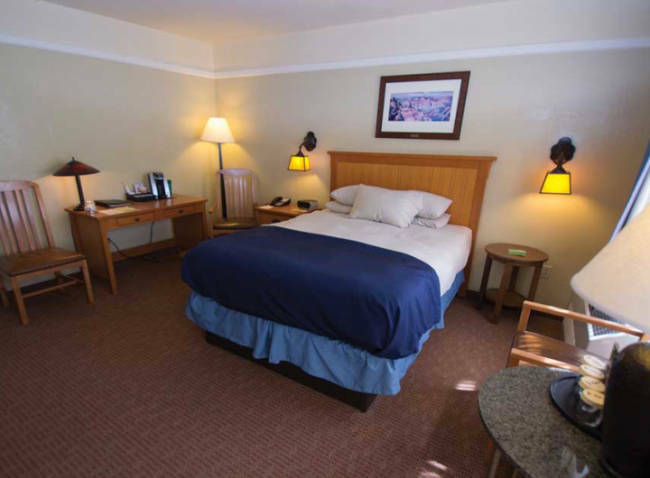 Amenities include cable TV, in-room coffee, telephone, air conditioning, and an in-room safe. These rooms are non-smoking and do not allow pets. 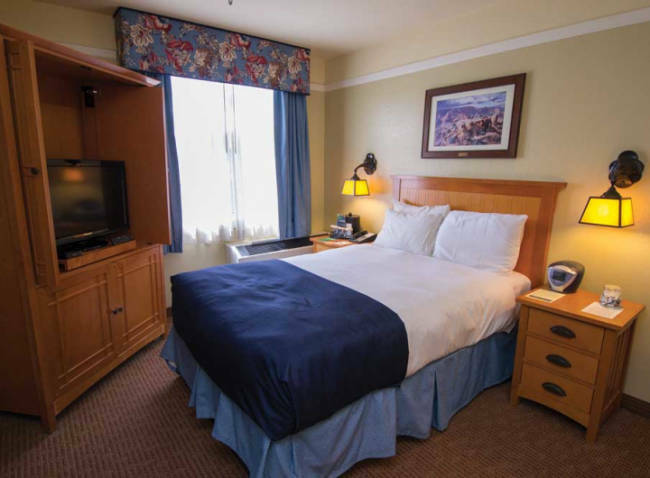 The Deluxe Rooms at El Tovar Hotel include either one king bed or two queen beds. These rooms include a full private bath and are more spacious than their standard counterparts. The king deluxe rooms will sleep up to three people with an optional rollaway, and the double queen rooms will sleep up to 5 people with an optional rollaway. 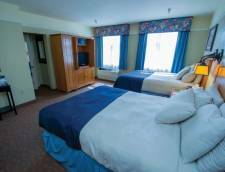 Deluxe rooms are non-smoking, they do not allow pets, and they come with the standard amenities such as cable television, telephone, air conditioning, in-room coffee and a private safe. Several suite accommodations are available at El Tovar Hotel, each with a slightly different theme and design. Bed arrangements vary in the different suites but all will include a bedroom with either one king bed or two queen beds and a separate sitting room. Many of the suites will include either a porch or a balcony where you can step outside and get some fresh air and enjoy the beautiful surroundings. The suites will sleep a maximum of 3 people (king suites) or 5 people (double queen suites) people with an optional rollaway. Rates Policy: Rates are based on double occupancy. 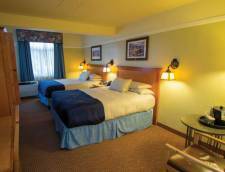 Each additional guest age 17 or over is an additional $14.00 per night.